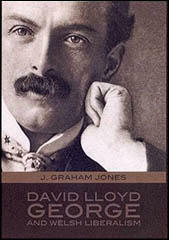 The slogan adopted by Lloyd George to promote the scheme was "9d for 4d". In return for a payment which covered less than half the cost, contributors were entitled to free medical attention, including the cost of medicine. Those workers who contributed were also guaranteed 10s. a week for thirteen weeks of sickness and 5s a week indefinitely for the chronically sick. The National Insurance Bill was introduced into the House of Commons on 4th May, 1911. Lloyd George argued: "It is no use shirking the fact that a proportion of workmen with good wages spend them in other ways, and therefore have nothing to spare with which to pay premiums to friendly societies. It has come to my notice, in many of these cases, that the women of the family make most heroic efforts to keep up the premiums to the friendly societies, and the officers of friendly societies, whom I have seen, have amazed me by telling the proportion of premiums of this kind paid by women out of the very wretched allowance given them to keep the household together." 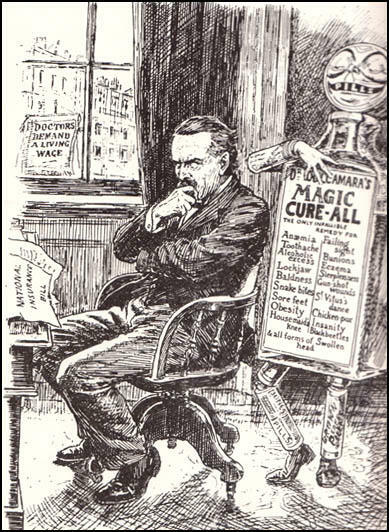 Lloyd George went on to explain: "When a workman falls ill, if he has no provision made for him, he hangs on as long as he can and until he gets very much worse. Then he goes to another doctor (i.e. not to the Poor Law doctor) and runs up a bill, and when he gets well he does his very best to pay that and the other bills. He very often fails to do so. I have met many doctors who have told me that they have hundreds of pounds of bad debts of this kind which they could not think of pressing for payment of, and what really is done now is that hundreds of thousands - I am not sure that I am not right in saying millions - of men, women and children get the services of such doctors. The heads of families get those services at the expense of the food of their children, or at the expense of good-natured doctors." Alfred Harmsworth, Lord Northcliffe, launched a propaganda campaign against the bill on the grounds that the scheme would be too expensive for small employers. The climax of the campaign was a rally in the Albert Hall on 29th November, 1911. As Lord Northcliffe, controlled 40 per cent of the morning newspaper circulation in Britain, 45 per cent of the evening and 15 per cent of the Sunday circulation, his views on the subject was very important. Patent Medicine: "Never mind, dear fellow, I'll stand by you - to the death!" Looking back on these three and a half months I am more and more impressed with the Chancellor's curious genius, his capacity to listen, judge if a thing is practicable, deal with the immediate point, deferring all unnecessary decision and keeping every road open till he sees which is really the best. Working for any-other man I must inevitably have acquiesced in some scheme which would not have been as good as this one, and I am very glad now that he tore up so many proposals of my own and other people which were put forward as solutions, and which at the time we had persuaded ourselves into thinking possible. It will be an enormous misfortune if this man by any accident should be lost to politics. I do not pretend that this is a complete remedy. Before you get a complete remedy for these social evils you will have to cut in deeper. But I think it is partly a remedy. I think it does more. It lays bare a good many of those social evils, and forces the State, as a State, to pay attention to them. It does more than that... till the advent of a complete remedy, this scheme does alleviate an immense mass of human suffering, and I am going to appeal, not merely to those who support the Government in this House, but to the House as a whole, to the men of all parties, to assist us... I appeal to the House of Commons to help the Government not merely to carry this Bill through but to fashion it; to strengthen it where it is weak, to improve it where it is faulty. I am sure if this is done we shall have achieved something which will be worthy of our labours. Here we are in the year of the crowning of the King. We have got men from all parts of this great Empire coming not merely to celebrate the present splendour of the Empire, but also to take counsel together as to the best means of promoting its future welfare. I think that now would be a very opportune moment for us in the Homeland to carry through a measure that will relieve untold misery in myriads of homes - misery that is undeserved; that will help to prevent a good deal of wretchedness, and which will arm the nation to fight until it conquers "the pestilence that walketh in darkness, and the destruction that wasteth at noonday". I have been beaten sometimes, but I have sometimes beaten off the attack. That is the fortune of war and I am quite ready to take it. Honourable Members are entitled to say that they have wrung considerable concessions out of an obstinate, stubborn, hard-hearted Treasury. They cannot have it all their own way in this world. Let them be satisfied with what they have got. They are entitled to say this is not a perfect Bill, but then this is not a perfect world. Do let them be fair. It is £15,000,000 of money which is not wrung out of the workmen's pockets, but which goes, every penny of it, into the workmen's pocket. Let them bear that in mind. I think they are right in fighting for organisations which have achieved great things for the working classes. I am not at all surprised that they regard them with reverence. I would not do anything which would impair their position. Because in my heart I believe that the Bill will strengthen their power is one of the reasons why I am in favour of this Bill. In Germany, the trade union movement was a poor, miserable, wretched thing some years ago. Insurance has done more to teach the working classes the value of organisation than any single thing in the whole history of German industrial organisation. I have met several German Labour leaders and Socialist leaders and employers, and they all say the same thing. May I also say another thing. They all state that when the matter was first of all proposed they were all dead against it. They criticised it, even more severely than my Honourable Friends have done this Bill and they regarded it with the same suspicion and apprehension. Their imaginations saw disaster and ruin in it. There is not one of them now who would lift a little finger to get it off the statute book. They have put every muscle into a fight to keep it there. You cannot get a Socialist leader in Germany today to do anything to get rid of that Bill, and I think they will find that many Socialist leaders in Germany will say that they would rather have our Bill than their own Bill. This Bill marks an enormous advance. If Honourable Members reject the Bill it will be a very serious responsibility. I do not think it is one for which the labouring classes would thank them. They are right in fighting for their trade unions. They represent, on the whole, the best stock of the working classes. I would remind them that this Bill benefits the poorer classes and that it will do greater things for them than any Bill introduced for a great many years in this House. It will remove anxiety as to distress, it will heal, it will lift them up, and it will give them a new hope. It will do more than that because it will give them a new weapon which will enable them to organise, and the most valuable and vital thing is that the "working classes will be organised £15,000,000 of them for the first time for their own purposes. Honourable Members can reject this Bill with all these boons, but it is a responsibility I am not prepared to share with them. Desiring, as I do, to see the Bill go through, if there was no alternative but to reduce the sick pay in order to get rid of this Clause, speaking for myself, I believe that would be a lesser evil. A second point is this: the last part of this Clause has a distinct tendency to weaken the trade union movement. I know that is not the intention of the Chancellor of the Exchequer. One of the strong reasons which now exists to induce workmen to join trade unions is the securing of a medium whereby compensation will be secured to them when accidents occur. Propaganda speeches are always taken up in part in showing the amount of compensation which the union has obtained for its members, and showing also that where there is no union the employers are apt to force a smaller scale on the men who are injured. If this Clause goes through that argument is taken away from the trade unions because the committee of the society which is their benefit society will be able to act for them - in fact is compelled to act for them. The Insurance Act will come into operation on July the fifteenth. I wish to make an appeal for a fair trial for the Act from the people in this country. There are those who forget that it is an Act of Parliament. In this and in every other country there are bad tempered people who want their own way; if they don't get it, they smash something. When these people lose their tempers they try to punish somebody; and, if they cannot punish the people responsible for the law that they do not like, they punish somebody who is near to them, somebody who is helpless, somebody who has served them faithfully. They cannot get at me, and they cannot turn the Prime Minister out; so they begin worrying the servants. They write letters to the papers threatening to reduce the wages of their servants, threatening to lengthen their hours - I should have thought that almost impossible - and, in the end, threatening to dismiss them. They are always dismissing servants. Whenever any Liberal Act of Parliament is passed, they dismiss them. I wonder that they have any servants left. Sir William Harcourt imposed death duties; they dismissed servants. I put on a super-tax; they dismissed more. Now the Insurance Act comes, and the last of them, I suppose, will have to go. You will be having, on the swell West End houses, notices like "not at home - her ladyship's washing day". 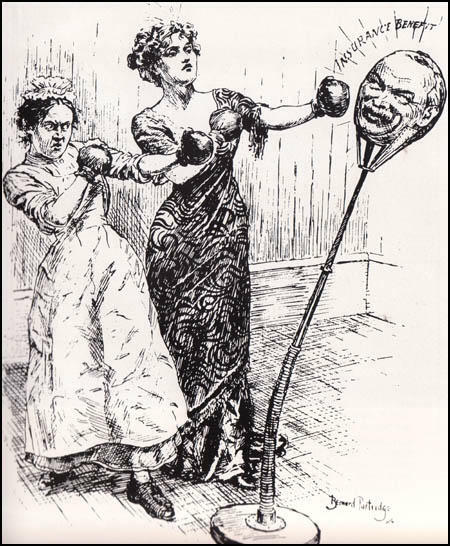 Later, when Northcliffe pursued his campaign in his latest acquisition, The Times, and advised his new public not to observe the Act, Lloyd George took on a different tone. Were there now to be two classes of citizens in the land - one class which could obey the laws if they liked; the other, which must obey whether they liked it or not? Some people seemed to think that the Law was an institution devised for the protection of their property, their lives, their privileges and their sport it was purely a weapon to keep the working classes in order. This Law was to be enforced. But a Law to ensure people against poverty and misery and the breaking-up of home through sickness or unemployment was to be optional. Was the Law for the preservation of game to be optional? Was the payment of rent to be optional?